The School of Peace | Welcome to Prints on Purpose! For the past several weeks, we’ve been taking a look at the Life School aspect of Soul Psychology. Your Soul Psychology is found in your fingerprint patterns. 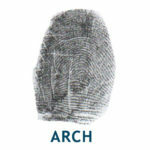 In last week’s post, I described the four basic fingerprint patterns—arch, tented arch, loop and whorl. Each of these patterns is associated with a particular Life School. The arch is associated with the School of Peace. If you have at least two arches in your set of ten fingerprints, you are in the School of Peace. What is the School of Peace curriculum? If you are in the School of Peace, you are here to learn to feel safe and secure, in your body and on this planet. This implies being at peace within yourself, and balancing work and play. It means dealing with a basic, internal anxiety that is intrinsic in this School, so you can be present, experience your life, and enjoy it. If you are struggling to feel safe and peaceful within yourself, how do you work with that challenge? If you are in the School of Peace, you may tend to operate from one of two extremes. At one end of the spectrum, you may keep yourself so busy, overcommitted and occupied with activities that you don’t have time to think or feel much of anything. You may create an endless chain of ‘emergencies’ by making mountains out of molehills, which provides plenty of distraction from what’s really going on inside. At the other end of the spectrum, you may try to anesthetize the anxiety through various forms of numbing self-medication (tv, food, alcohol, drugs, web-surfing). You may adopt a false attitude of ‘Mr./Ms. Mellow’ (an artificial overlay of serenity, rather than the real thing), or make molehills out of mountains in order to avoid dealing with the fear involved in dealing with significant life events. The School of Peace is designed to give you experience in navigating these extremes, so you can find your own place of balance. What steps can you take to stay grounded, and feel the peace that comes from being genuinely present for your own miraculous life? This entry was posted in Hand Analysis and tagged Decode, Life School, School of Peace, Soul Psychology on June 8, 2016 by Donna Mills. Oh I love this approach to understanding the self more. Anything that helps us find more balance and a deeper look into why we are the way we are is a good thing. I wonder — if there are different schools, are we a little of all of them, but one is dominant? Yes, in a way. As I was discussing in last week’s post, we are in a sort of ‘life university,’ and while we all have general ed requirements, our Life School can be viewed as our major. For example, I’m not in the School of Peace, but when I have a life circumstance that causes me to feel very fearful, I can either get extra busy to try to blot out the fear, or watch a lot of tv or read in order to take my mind off of whatever the problem is–the two reactions that are very much part of the School of Peace. The difference is that my reactions are more circumstance-related. A person in the School of Peace deals with that challenge all the time, since the lessons of balance, feeling safe and secure, and being present are what folks in the School of Peace are here to focus on learning.